← Happiness is a land of chocolate! The Oreo just turned 100 years-old today. As a kid, I loved these cookies, and today, I can still eat a few. I even like the Halloween ones that have orange filling. They are a most happy cookie. 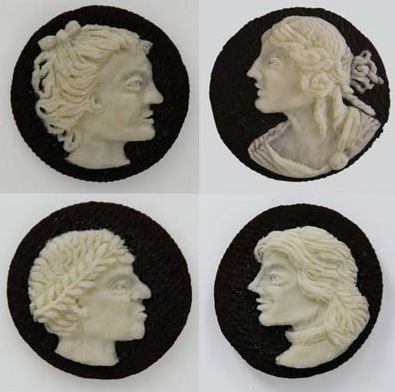 The most creative thing I have ever seen done with an Oreo is the cameo. It amazes me what people create. These are crazy, and very cool. These were made by the talented hands of Judith G. Klausner, and you can view these on her site. Looking for fun Oreo facts such as…there’s a green tea Oreo variety in China? Wikipedia has more trivia I would even want to list here. Posted in Childhood memories, Cookies. Bookmark the permalink. Judith G. Klausner could have called those Came-O’s, and they most likely will last as long as a real Cameo considering the shelf life of the creme filling.